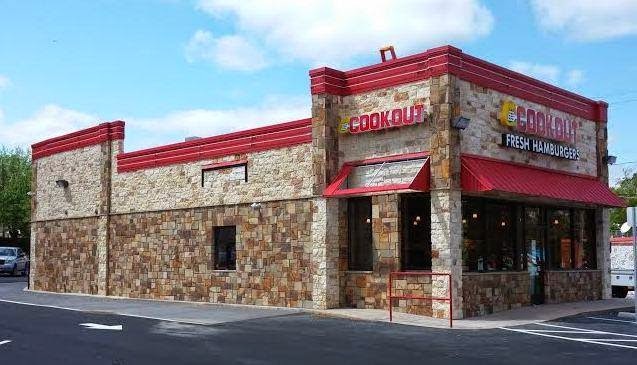 North Carolina-based Cook Out plans to open a new restaurant in Marietta later this year. The new Cook-Out restaurant will open at 3800 Austell Road on the site of a former KFC. The roughly 2,300 square foot restaurant has great visibility and plenty of parking. The new Cook Out is located not far from WellStar Cobb Hospital in West Cobb county. Unlike Atlanta-based Chick-fil-A, who celebrates grand openings with day long camp outs, Cook Out literally opens its doors and is seemingly immediately inundated without any promotions or specials. Cook Out is known for cheap food and featuring nearly forty different milkshakes. A combo meal costs five bucks with the option to upgrade the drink to a milkshake for another dollar. Privately held Cook Out entered the Georgia market in 2013, and today has twenty-one locations in the state. In addition to North Carolina and Georgia, Cook Out also operates in South Carolina, Tennessee, Alabama, Kentucky, Maryland, Virginia and West Virginia. Cook-Out also operates Twitter and Google+ pages but might want to consider replacing the Google product with an Instagram account. Cook Out also recently revised their website to include more images, functionality and even nutrition facts. In case you were wondering, the least caloric of the chain's milkshakes is the "Fresh Banana," with 538 calories, and the worst is "Cherry Cheesecake," with 925 calories. The website also indicates an "online store" is coming soon! Where would you like to see Cook Out open next? What is your favorite Cook Out menu item? Do you think Cook Out is overrated? Cook Out "Quantity, not quality"
Cook Out is awesome! It was one of the things I missed the most about NC. Glad they are expanding down here. They need one between GA400 and Peachtree Industrial Blvd, OTP. Quality and quantity at cookout ! I loved Cookout when I lived in NC ... years ago. IMO, now that they are expanding the quality has gone down. The past two summers I have visited different locations in NC that our family had been to before and the food was bad, and service was even worse. As a NC native it is disheartening to admit that I wouldn't visit one if built in my part of metro ATL. ^^ In another posting on Cook Out I HAD posted that I wanted one in my area of ATL. Again, after the last two disappointing visits at NC locations I have changed my mind. I grew up eating at Hardee's (hamburgers) so I know that expansion can change the product(s). I'm waiting for the Krystals on Northside Drive and Moreland Ave to close. Cook Out opened up next to both Krystal locations, and now they are always empty! Cookout has he highest quality flame grilled burgers with cooked out flavor from the flame grilling - better than all other quick serve restaurants. Most of all the other items on menu are hokey. Great slaw. Great chili. Great burgers. All other combo items are blah. Oh wait and don't let us forget: better thank coke, better than dr pepper, CHEERWINE on fountain! Not in Alabama.....yet. Although there appears to be an unrelated restuarant in Phenix City called "The Cook Out"
Once the Chattanooga locations open, Huntsville could be on their radar. And Auburn is close to the state line too! Would love to see Cook Out come to Buckhead/Brookhaven. I think the burgers are about as good as many "better burgers" at higher price points. And the shakes, of course, are awesome. Buddy's at Johnson ferry and peach tree is ideal, also the former McDonald's on Buford at clairmont. Anyone know what's going up at Buford where Juua was? A new Bojangles' and O'Reilly Auto Parts are coming to that site.